Icon Pistons brings the same quality and performance you've come to expect from United Engine brands. Pit Stop USA is The Online Motorsports Superstore! 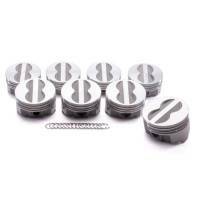 We feature KB Performance Forged Pistons for Small Block Chevy at low everyday prices. Icon FHR Series Forged Flat Top Piston Set - SB Chevy 350 Bore Size: 4.030", Stroke: 3.480", Rod Length: 5.700"
Icon Pistons Performance FHR Series Forged Dome Piston Set - SB Chevy 283-400 - Bore Size: 4.030", Stroke: 3.480", Rod Length: 5.700"
Icon Pistons Performance FHR Series Forged Flat Top Piston Set - SB Chevy 283-400 - Bore Size: 4.040", Stroke: 3.480", Rod Length: 5.700"
Icon Pistons Performance FHR Series Forged Flat Top Piston Set - SB Chevy 283-400 - Bore Size: 4.060", Stroke: 3.480", Rod Length: 5.700"
Icon Pistons Performance FHR Series Forged Flat Top Piston Set - SB Chevy 283-400 - Bore Size: 4.155", Stroke: 3.750", Rod Length: 5.700"
Pit Stop USA is The Online Motorsports Superstore! United Engine and Machine Company was started in 1922 in Fresno, California. Then in 1930 the company was moved to San Leandro, California in order to supply OEM manufacturers located on the West Coast. The company relocated to Carson City, Nevada in 1978, where it has continued to grow. Since its move, United Engine has continued to look at it's role in the domestic and world market. Currently, UEM manufactures the Silv-O-Lite OE aftermarket piston line, KB Performance Pistons (including the motorcycle division), and The Claimer Performance Piston Series. United Engine and Machine Company is now enjoying more than 80 years in business. United Engine and Machine Company is proud to introduce their new Icon line of forged pistons. Icon brings the same quality and performance you've come to expect from other United Engine brands while adding a new lightweight forged design. 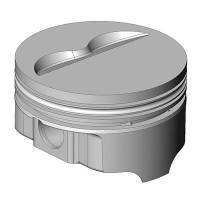 No matter your high performance application, there is an Icon piston for you. We feature Icon Pistons Premium Forged Pistons, Icon Pistons Premium Forged Series Dome Piston Sets, Icon Pistons Premium Forged Series Dome Pistons, Icon Pistons Premium Forged Series Flat Top Piston Sets, Icon Pistons Premium Forged Series Flat Top Pistons and more at low everyday prices.